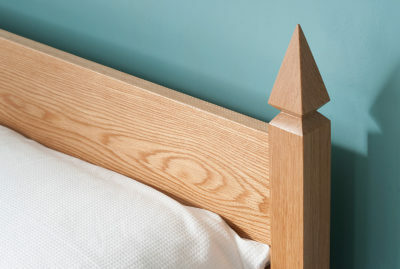 At Natural Bed Company we use only solid timber to make our bed bases. Natural solid wood furniture is beautiful, each piece unique – there are so many wonderful timbers each with their own distinct properties. Each section of timber will be distinct from the next, the variation in colour, tone and grain giving life and individuality to any design. 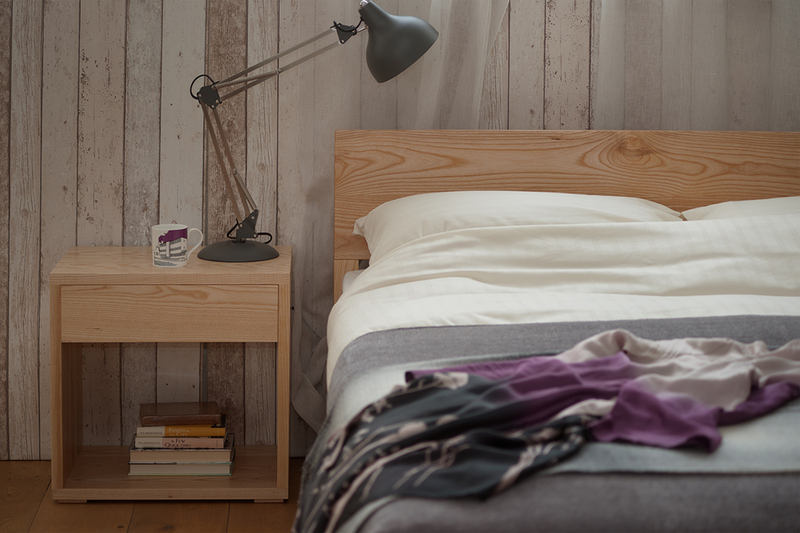 We hope our simple, stylish bed designs draw attention to the chosen timber, after all the headboard can be the perfect showcase for a vivid grain or subtle range of shades. It is due to this love the solid walnut, cherry, oak, maple, ash, beech and pine we use that we are so excited about the new lacquer finish we are able to offer! Our previous clear lacquer finish has a soft sheen and added a degree of warmth to the natural tone of the timber. This would continue over time resulting in a warm cast to each wood. Our new ‘natural’ lacquer finish has been named for it’s clarity, it allows you to appreciate the myriad colours and subtle variations in tone of natural timber. 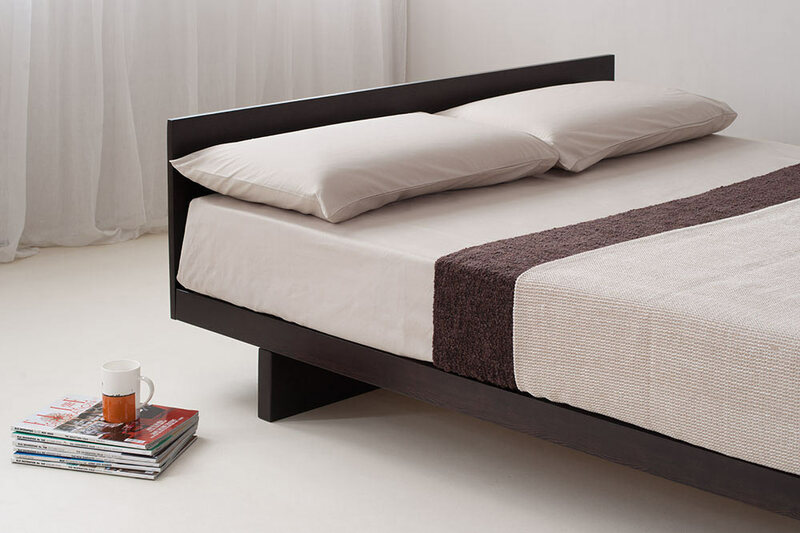 It retains a subtle, soft sheen which protects the timber from grease marks and some stains, but the timber retains a very natural, authentic hue. 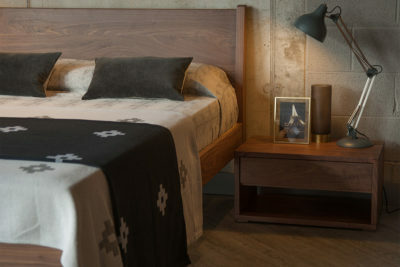 Both lacquer finishes are available, so don’t worry – if you want to order bedside tables to match* the bed you bought last year – it’s not a problem – just be sure to discuss this with us when you place your order. Shown above on the left is a new sample of oak with the new ‘natural’ finish, on the right you can see an older oak sample with the previous, warmer, clear lacquer finish. The new finish of oak is a slightly cooler shade than it appeared with the previous finish, the soft sand tones are subtle and varied. Oak does deepen in shade over time, growing subtly warmer. Shown above on the left is a new sample of walnut with the new lacquer finish, on the right you can see an older walnut sample with the previous, warmer, clear lacquer finish. The new finish over solid walnut results in a slightly softer shade than with the previous finish, the grey tones are clearly visible along with the biscuit and russet tones. Walnut does grow subtly warmer, but may well get paler over time. Shown above on the left is a new sample of ash with the new finish, on the right you can see an older ash sample with the previous, warmer lacquer finish. The new finish to the solid ash brings out all the beauty and variety of this lovely timber. Soft cream tones with a rich golden grain, with subtle hints of taupe, are clearly visible. Ash does grow subtly warmer and will deepen over time. Shown above on the left is a new sample of maple with the new ‘natural’ finish, on the right you can see an older maple sample with the previous, warmer lacquer finish. The new finish of maple is a slightly cooler shade than with the previous finish, the soft cream tones are visible, the grain clearly a deeper tone. Maple does warm in colour over time. Shown above on the left is a new sample of cherry with the new ‘natural’ lacquer finish, on the right you can see an older cherry sample with the previous finish. This new finish again shows the wide variety of tones within natural timber. Soft sage and rust tones are visible within this richly hued wood. Cherry does deepen in shade over time, growing even richer. Shown above on the left is a new sample of beech with the new finish, on the right you can see an older beech sample with the previous, warmer lacquer finish. Here the difference between the look of new finish and the previous lacquer is quite subtle. The new finish results in a slightly cooler shade than with the previous finish, which gave a soft golden (almost apricot) look. Beech will deepen in shade over time, growing subtly warmer and rosier. Shown above on the left is a new sample of pine with the new finish, on the right you can see an older pine sample with the previous, warmer lacquer finish. There is very little difference between the two finishes on pine, the new ‘natural’ lacquer is just a little cooler. As with most of the other timbers, solid pine will become deeper in tone, here becoming more golden in hue. Please note the images are just examples of timber, every section of timber will vary in grain and hue. 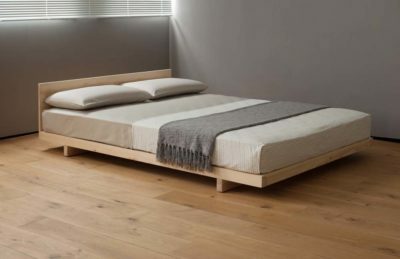 * the natural characteristics of solid wood mean that there is no such thing as an exact ‘match’ – we will do our best to select timber of a similar grain and tone for every section of your bed/bedside tables – but the beauty of real timber is it’s variety, so the sections of timber will never be identical. Newer Duvets and quilts, hotwater bottles and throws. 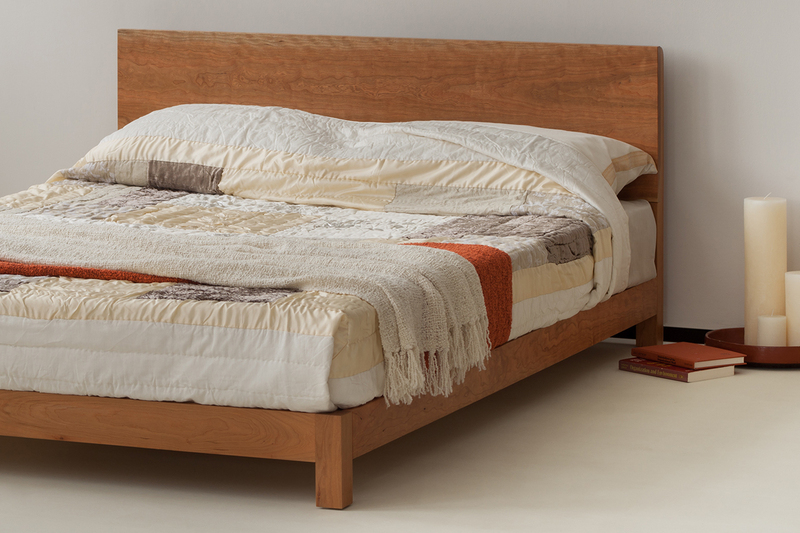 Keeping toasty with Natural Bed Company!